The aggressive title to this post would suggest that the following list is a savage stew of meat-themed heavy metal songs, but that in fact is not the case today. Totally unrelated to holidays, but there’s something about this one that instantly gives me a mental image of a drunken Uncle dancing around the living room and eventually falling down on the tree and taking it with him to the floor. Deep burn. That’s the feeling you get from this forgotten gem from Glenn Frey’s catalog. He’s always held the saxophone in high regard and obviously it worked out for him. Everyone needs to stop talking about “You Belong to the City” for 4 minutes and 34 seconds and let this one slide in and sink in. Here’s the first real “holiday” sounding track of the bunch, a beautiful ballad from the St. Elmo’s Fire soundtrack. This is a crucial number for curling up with your lady tiger in front of a roaring fireplace, preferably spread out on a Buffalo rug. Weeper of all eternity right here, but in a good way. Like so many others, we watch Planes, Trains and Automobiles every year at the TNUC castle and it’s this scene in the movie that really pulls at the heartstrings. To me, it’s the official John Candy war cry. The saxophone enters this song like a tidal wave and all it’s emotion comes splashing down right with it. The freeze-frame moment at the end of Uncle Buck when he’s waving goodbye to Tia will always get me! We miss you John. 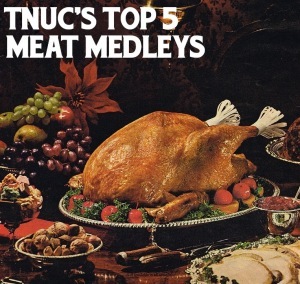 Here’s a download of all the meaty medleys.